Dubai, the second largest of the seven Arab Emirates was once a small trading post whose inhabitants, the Bedouin, roamed the vast sandy expanses as nomads. Today, the Emirate and namesake capital, Dubai City, is the product of 20 years intense development and has been utterly transformed into a modern, cosmopolitan, technological advanced metropolis where the majority of the Emirates population resides. Unlike Abu Dhabi, Dubai's wealth is not based on oil revenue - being just 6 per cent of GDP - but as a consequence of its population's entrepreneurial spirit. The Arabic tolerance of other peoples' customs and lifestyle and their reverence for courtesy and hospitality and the genuine warmth visitors receive makes for an enjoyable stay, whether on business or vacationing. 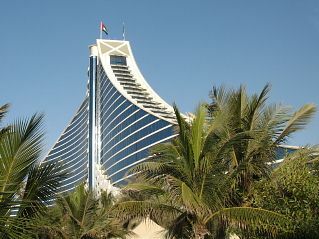 Business travellers as well as tourists will likely require a visa to enter Dubai, supplied by the hotel or tour operator, but the opportunity to remain resident and do business and even own 100 percent of a company in the Free Zone makes for an attractive investment for foreign businesses. The recently-developed commercial and transportation infrastructure, the latest cargo handling facilities along with Dubai's location means the port is served by an ever growing number of international freight lines. Moreover, feeder services to Iran and other countries and Dubai's status as a leader in intermodal freight trade means that sea to air transfers are amongst the fastest in the world at its cargo village. Specialist storage facilities like cold stores for reefer container shipments and abundant low cost warehousing makes Dubai a transshipper's heaven. Freight aside, the ease of recruitment of highly skilled engineers and craftsmen from across the globe but now resident in Dubai means that business can be set up quickly and efficiently. Energy is extremely cheap and plentiful. The Free Zone Authority offers excellent administrative supports services. Outside the Free Zone the usual Emirate business laws applies with 51 per cent business ownership afforded local partners, however this is a small price to pay for such concessions as exemption of import duties, full repatriation of capital and profits. Information technology companies such as IBM, Microsoft and Oracle have established presences in Dubai Internet City, a technology park created by the Dubai government to create and nurture emergent technologies. Seafaring visitors will dock in the largest man-made harbor in the world, Jebel Ali, constructed in the '70s; those arriving by aircraft will land at Dubai International Airport which, in 2006, managed some 237,258 flights and a total of nearly 29 million passengers by over 90 international airlines. It is one of the world's busiest airports accepting traffic to and from over 110 destinations. Getting around the Emirate is easy on its top-class highways, either by taxi or with a hire car - for which visitors must obtain a temporary local driving licence, organised by the hire company. It is also possible to travel by water taxi, an abra, between Dubai City and Deira. Dubai city is bisected by the Creek, a sea-water inlet and the focus of bustling activity as dhows load and unload their often colorful cargoes as they have done for thousands of years' using ancient trade routes. Much of the produce ends up in the souks (markets), notably in the Deira side of Dubai City, where a multitude of alleyways have escaped the frenzied redevelopment and the scent of spices hangs heavily in the air. Gold can be found in the larger alleys in the form of rings, ear rings, bangles, necklaces and brooches in shop windows at remarkable prices, probably cheaper than anywhere else in the world. The fish souk in Deira is a place of frenetic bargaining during the mornings and evenings as local fishermen offload their catch of fresh fish to stall holders or the public. The smell of rock cod, mackerel, red snapper, king fish, barracuda, tuna, crab, king prawn, lobster, seabream, squid, pomfret, shark, sardine and other species permeates the air.